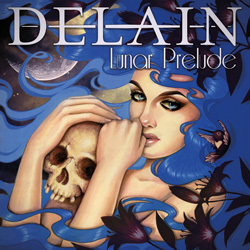 The great news is that the musical juggernaut that is Delain shows no sign of slowing down. Hot on the heels of a successful UK tour during which a new song ‘Turn The Lights Out’ was premiered the Dutch band formed by keyboard player Martijn Westerholt and fronted by Charlotte Wessels are back with an eight-track half-studio / half-live EP – although to call it an EP does the release a slight injustice as at 33 minutes it’s as long as the early Kiss and Van Halen albums – entitled ‘Lunar Prelude’. The pair of new cuts on offer – lead track ‘Suckerpunch’ and the aforementioned ‘Turn The Lights Out’ – see the band taking a left turn into a heavier part of town than they usually visit on plastic, while still retaining the poppy edge that makes Delain so appealing and such a great live act: ‘Suckerpunch’ in particular boasts a Nightwish swagger. A new version of ‘Don’t Let Go’ shows that this is no flash-in-the-pan, the re-recorded version clenching its fists and bearing its teeth and ready to take on all comers with brazen orchestration all too familiar to fans of Finland’s finest. The four live cuts - ‘Lullaby’, ‘Stardust’, ‘Here Come The Vultures’ and ‘Army Of Dolls’, all from 2014’s ‘The Human Contradiction’ – ably capture the essence of the band on stage where they are naturally heavier anyway. And although they don’t differ much from the studio cuts they do show what this fabulous band can offer when the lights go down and the amps are cranked to the maximum. The only weak link is the final cut ‘Suckerpunch Orchestra’, a short and rather pointless reprise of the opening track which just seems to confirm that if you’re the keyboard-playing leader of a symphonic metal band it’s hard to avoid the shadow of Tuomas Holopainen.